Now that you are seriously considering downsizing, Land Lease living looks like a great option, after all there are no entrance or exit fees, no stamp duty and no council rates, plus you own you own home! So what is living in a leading Land Lease Community really like? How do you know if you’ll fit in? Why are seniors moving to this type of community? Here you’ll find a range of free downloads that will tell you everything you’ll ask and if not, please call us on 1800 462 326. What’s it like to live here? Why our homeowners are truly happy? What’s to love about OC? Is this the lifestyle for you? 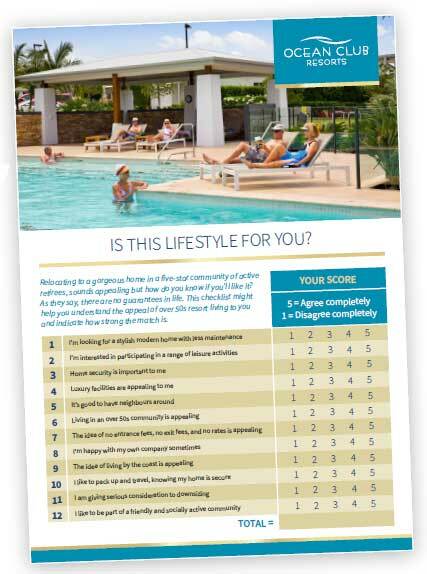 This new document allows you to test your affinity for Land Lease Community living, based on your responses to a range of seniors living attributes. Not only is this checklist fun – it will give you a helpful insight to evaluate your options.